Shinobu: ...This isn't our time...! 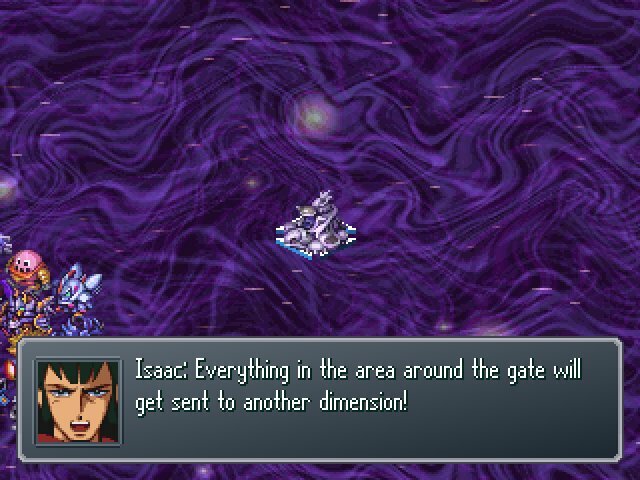 Guld: No, I doubt this is even in our dimension...! Kosuke: Did we fail to make the time-jump!? Diana: We must emerge victorious from this last battle, no matter what. Kouji: Alright! We can handle that!! 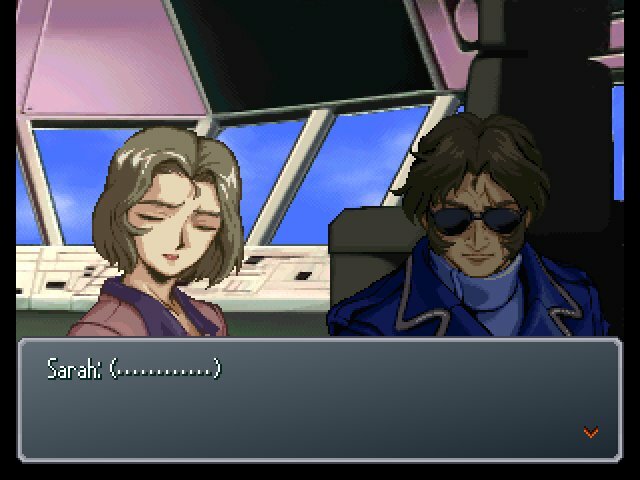 Kamille: We can't let Magus change our history, or our future! Fokker: Alright, Skull Leader to all units! These are your final orders!! 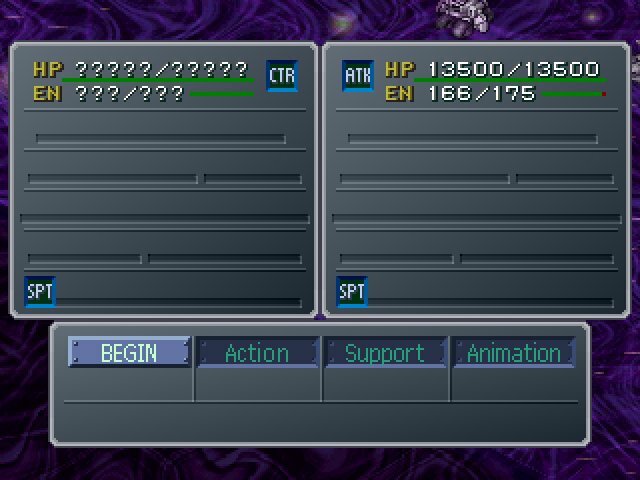 The units you see here are pretty much all you'll have to fight. 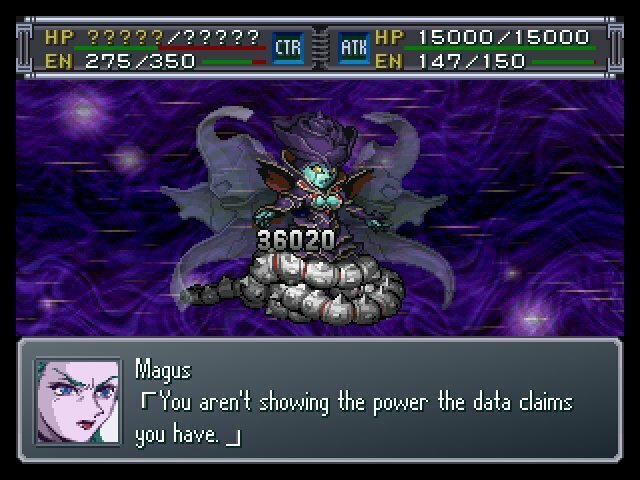 A couple of reinforcement Bergelmirs show up when Magus gets knocked under 60% and 50% health (2 each time), but they're pretty easy to ignore. The main pain here is that they have 23,000 HP apiece and their AI circuits have level 2 support. Not pictured: Banjou got benched this time in favor of Diana and the Soleil. To end this in any efficient manner, I'd need her Rouse skill. Bright's Faith skill boosted Diana's Rouse count even further. 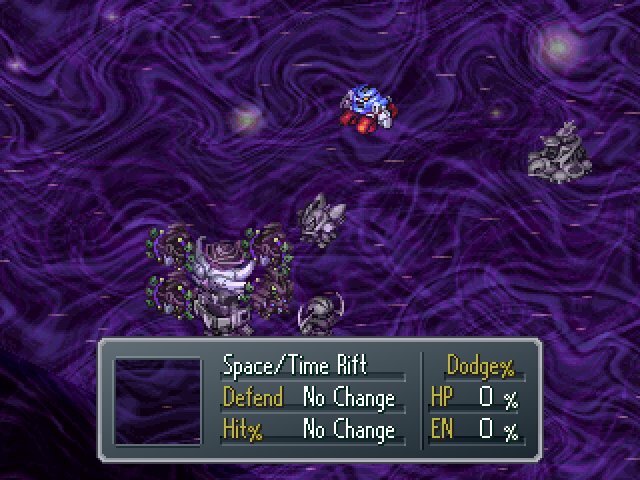 My approach to this fight was to stack everyone around the Soleil for morale boosting while sending Shin Getter into the front lines by itself to clear out the attackers. Thurisaz had a pretty good time of things. 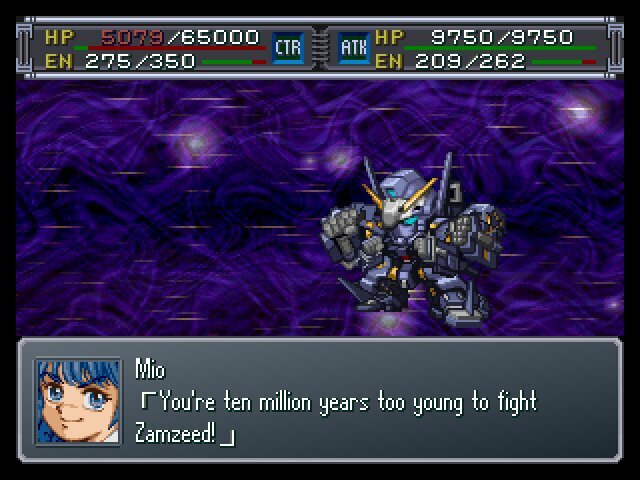 He took to Shin Getter-3 readily. Picture this plus Ansuz drilling things over and over until they went down. 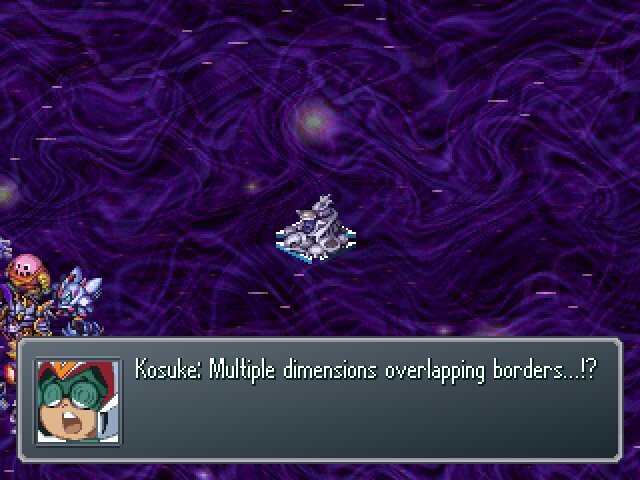 Once that was done with and Shu's morale was sufficiently boosted through Rouse stacking, I sent Cybuster up to clean up the supporters around the Aurgelmir, which had not once bothered attacking Shin Getter. 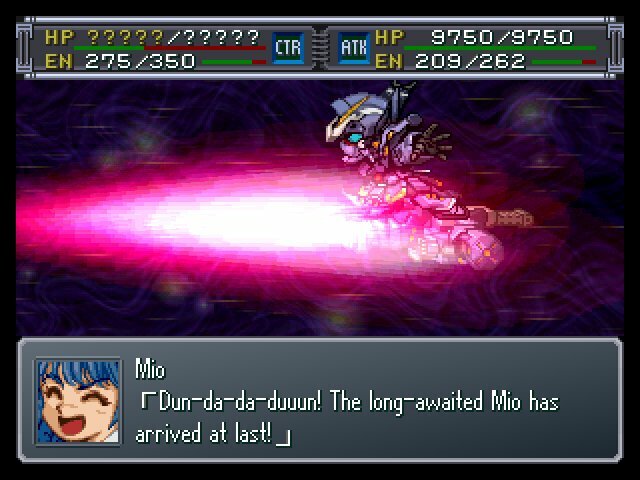 With sufficient morale and EN (or EN-restoring abilities, in this case), plus liberal use of Enable and Soul, Shu was able to knock them down to critical in three attacks. Once that was done, I packed everyone into the Soleil and hauled them all up to the boss, then unloaded everything I had at her over the course of three turns. She did that annoying thing where she cast Wall once she approached critical health. 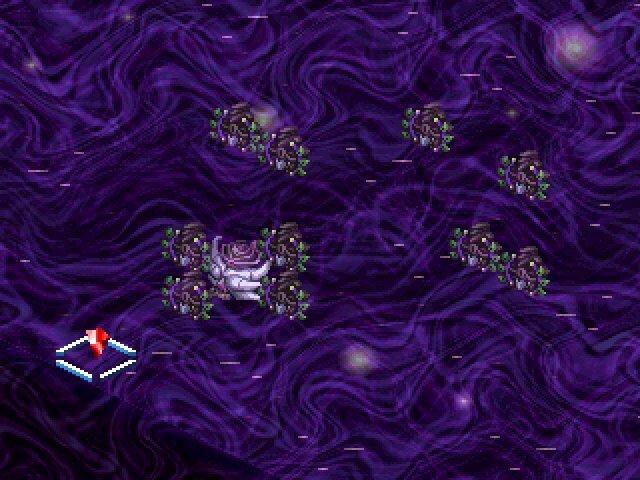 Incidentally, this is the terrain for this fight. 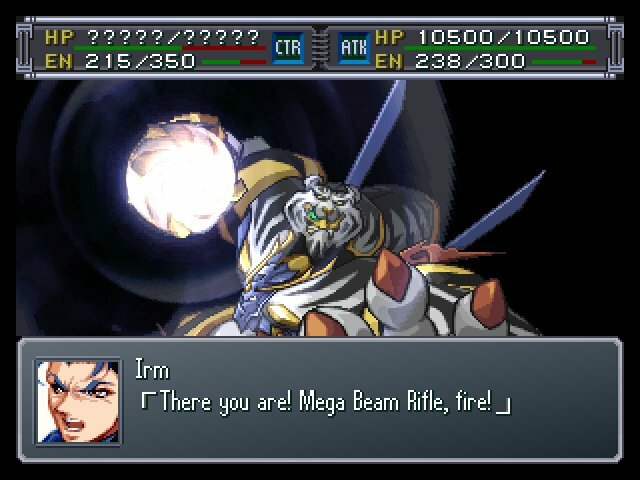 Pictured: Irm using a drill hand. 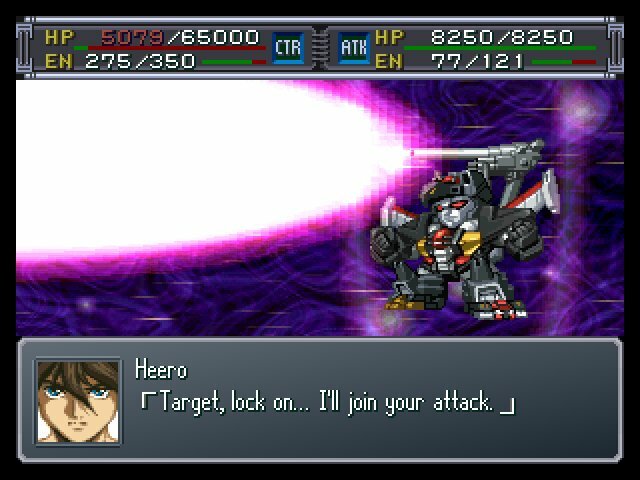 Dancougar's a pretty good fit for Heero, being an energy guzzling beam firing monster. 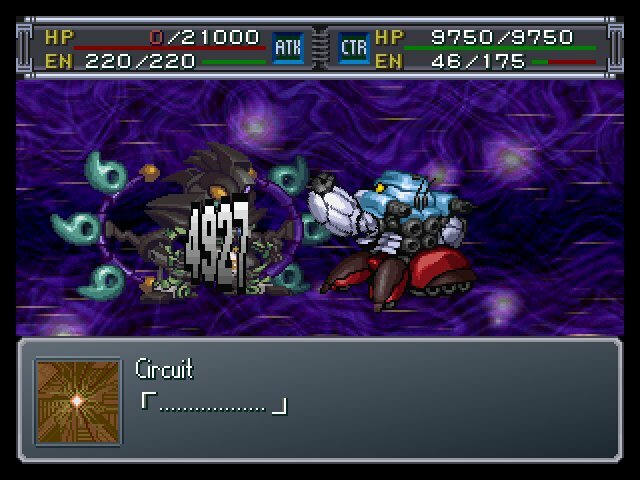 This fight wasn't lacking in display glitches either. 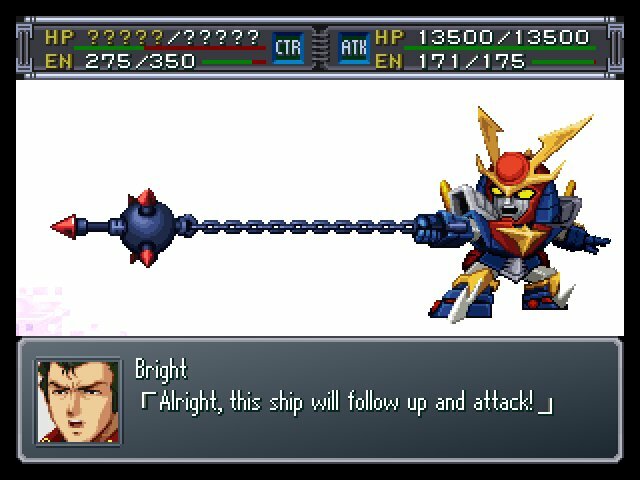 Brightarn-3 was pretty much the MVP support attacker of the day. 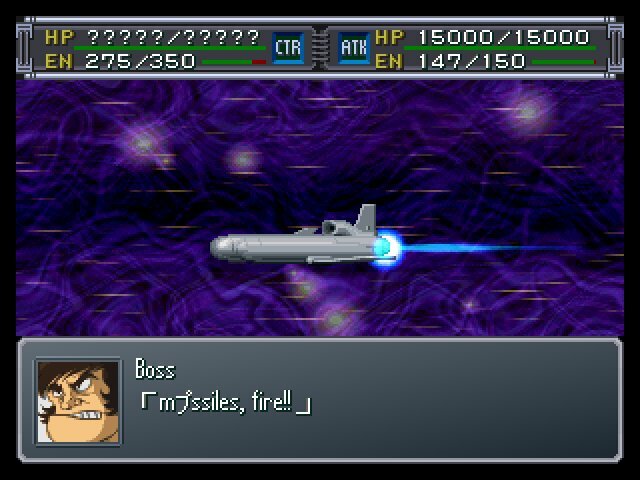 Good job Boss, now you have speed lines behind your missile to make it go faster. The damage of Boss's Nuclear Missile with Blitz. 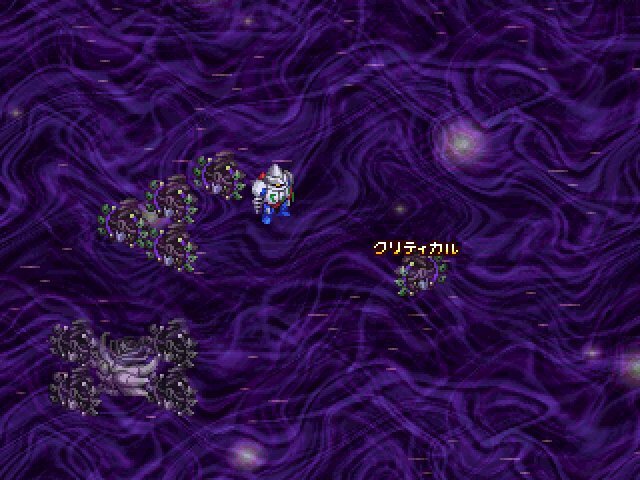 I finally got a proper chance to show off the Alpha sprites for G-Sword Diver. And with that, the Aurgelmir went down a lot more easily than last time, thanks to proper setup and Diana being overpowered. 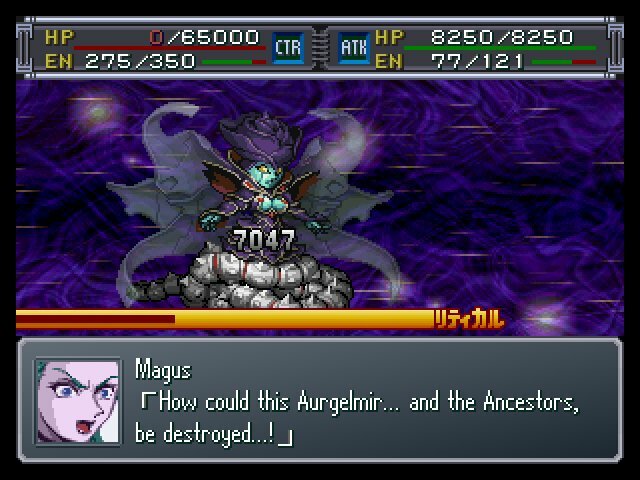 Magus: Th... the Ancestors... the... Aurgel... mir... is...! 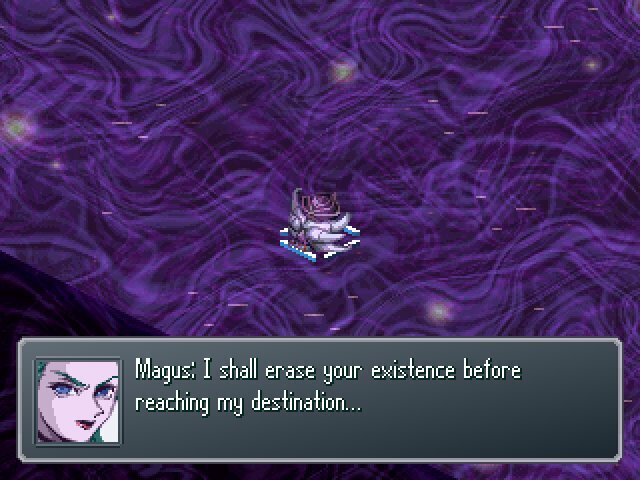 Magus: Wh... What did you say...? Hyouma: Kosuke!! What's going on!? Amuro: All units! Stick close together! Don't let yourselves get separated!! Fokker: Move it! Get the guys on the outskirts, and grab ahold of the ship!! 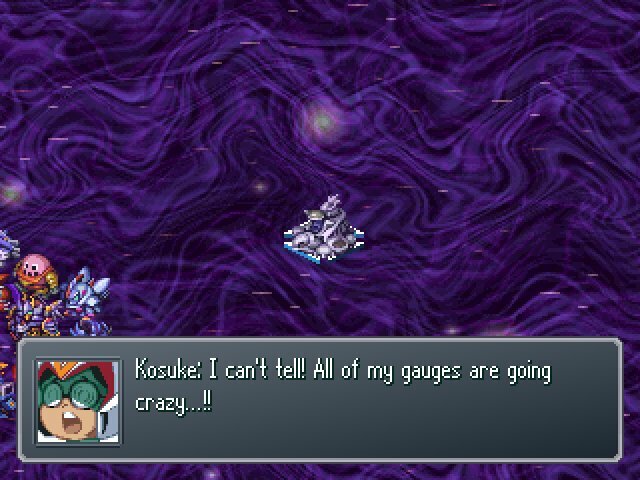 Kouji: It's no use! We're not gonna make it!! Phil: Lady Diana! 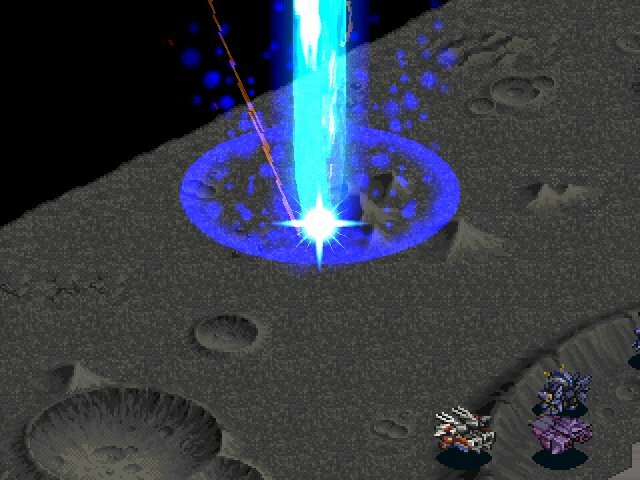 There has been a large explosion in the Earth Cradle's central sector!! Diana: What is every ship's status!? Did everyone make it out!? Phil: The Iron Gear and Freeden are both confirmed!! They're ascending behind our ship!! Diana: What about the Ra Cailum!? Phil: Th-the Ra Cailum... The Ra Cailum acted to shield us...!! Phil: Induced explosions in every section of the Earth Cradle!! 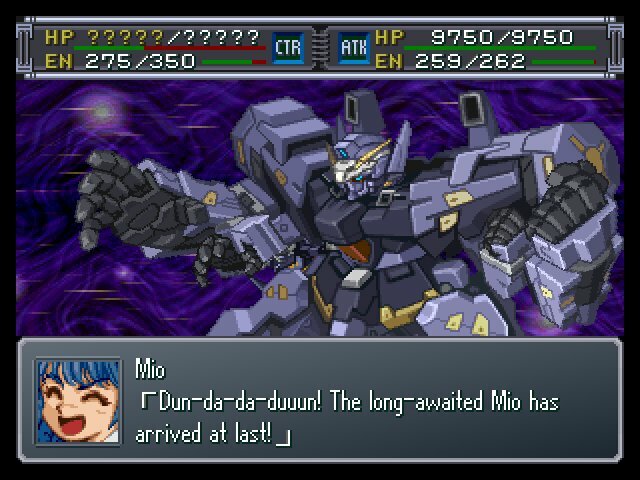 Shockwave, incoming!! Diana: Let the Soleil be a shield! The Ra Cailum...! We must save the Ra Cailum!! Phil: I-it's no use! We won't make it!! Jamil: ......Sarah... What's our current situation...? Jamil: What about the Iron Gear... and the Soleil...? Jamil: And Garrod... and Jiron's group? 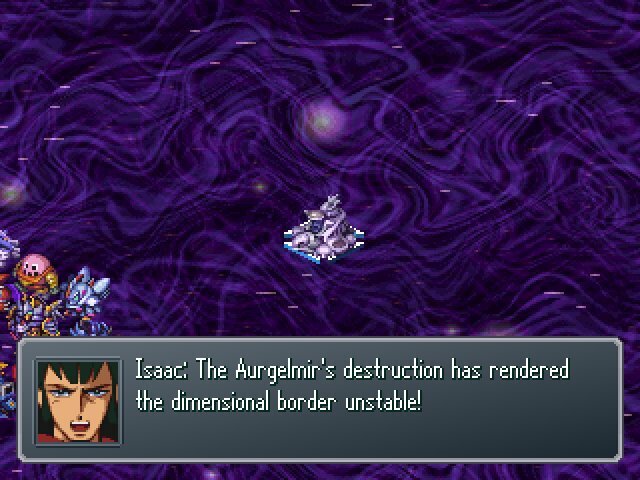 Jamil: ...And, the Ra Cailum...? Jamil: Wh... What'd you say...!? Sarah: ...You think... I'd know the answer to that...? 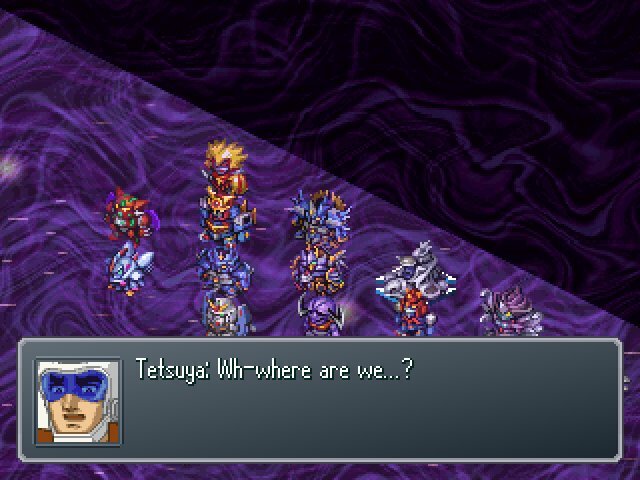 Chiru: Hey... What happened to Kouji and Akira and all those people...? 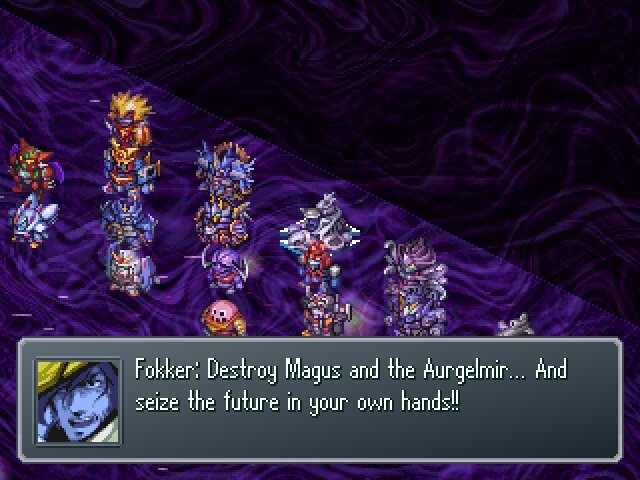 Chiru: ...Could it be... Did they all die...? Rag: ...Like I'd know that...? Jiron: Whatever anyone else says, I believe in them...! 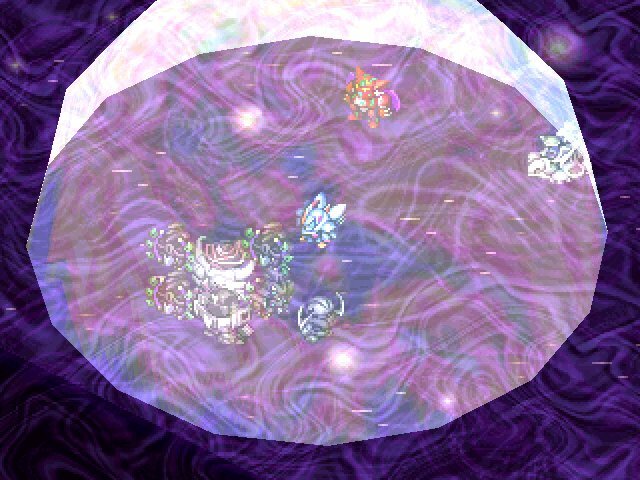 The next portion of the ending follows the same events in the future world as the Hard mode ending, up to and including launching the Ra Cailum (renamed the Laura Ran) into space. I guess they dug up a second one? Oh yeah, we hacked in an Alexandria-class battleship being piloted by Henken. It's there. From there, it follows the same tearful reunions being cut short by the approaching shockwave. 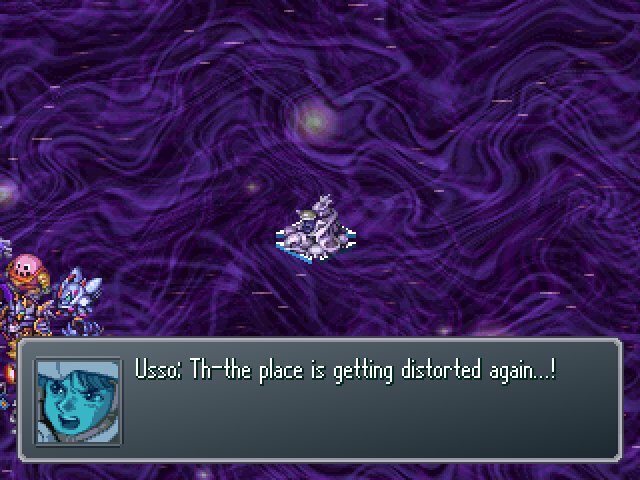 You get the same ending movie as Hard mode, and the same intermission resolutions afterward, with no battle taking place on the moon. 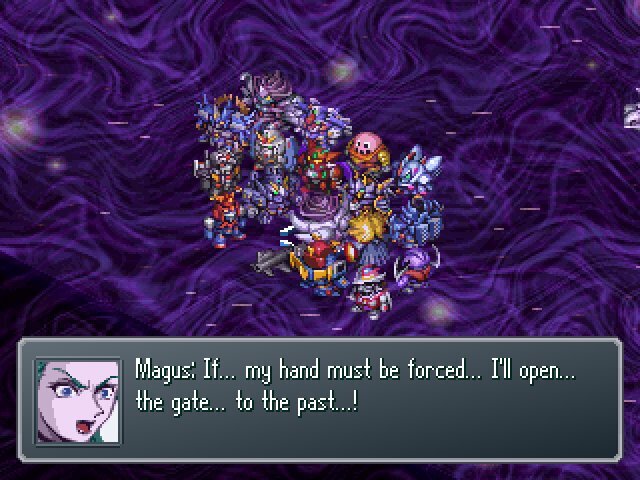 This ending makes a lot less sense than Hard mode's ending in my view, mainly because it complete neglects the whole coexisting Shin Getters and Mazinkaisers. 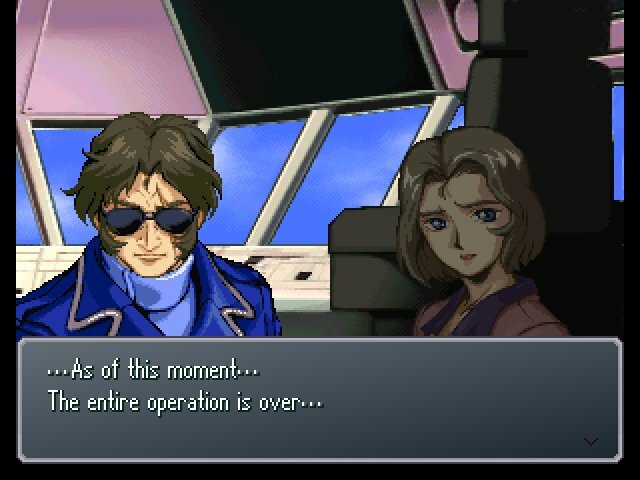 At least the other ending had Sophia sending everyone "back to their proper time" which could have implied a resolution for that. I'll accept Tobias's ending as the only proper canon resolution. The story also fails to account for the Aurgelmir's "black box", the Astranagant. 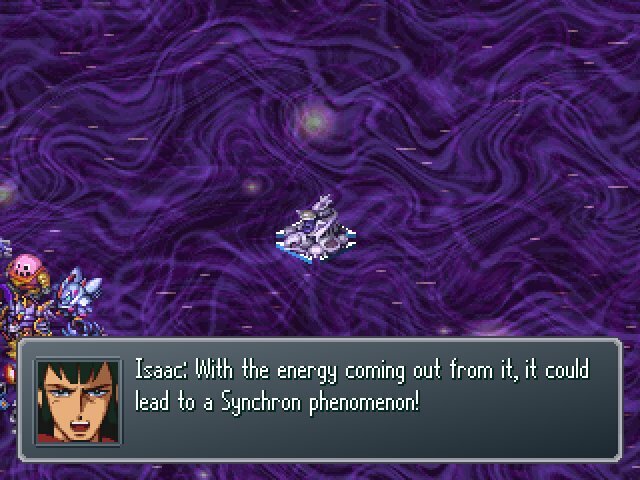 It resurfaces in Alpha 3 drifting in space. 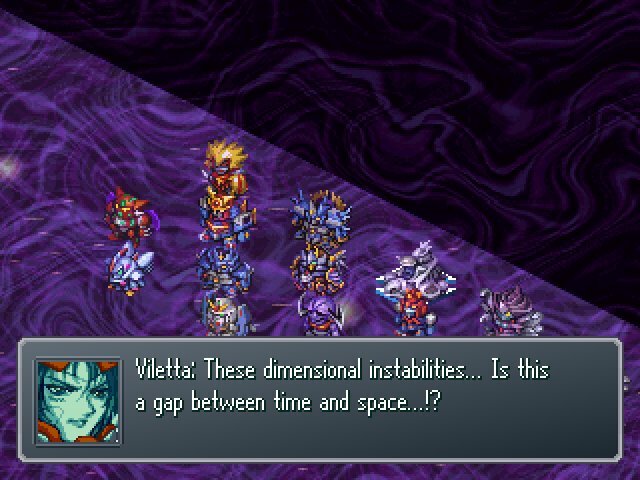 I have no explanation short of time diving for how it could reach the Earth when it was initially lost in a sub-dimension in outer space back in Alpha 1, much less how it could feasibly be found and adapted by a group of bosses sleeping in the same spot in Africa for thousands of years like robot masters waiting indefinitely for Megaman. 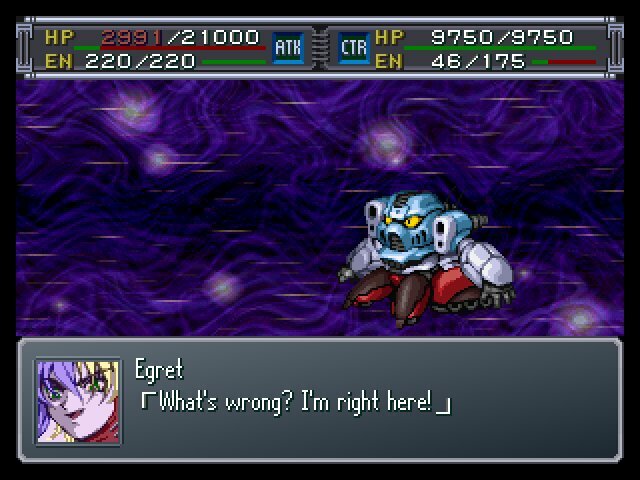 Edit: While I'm on the subject, I feel kinda bad for Dr. Egret Fehu in the Alpha series. I'm not going to spoiler tag this because it's basic game knowledge in both cases. 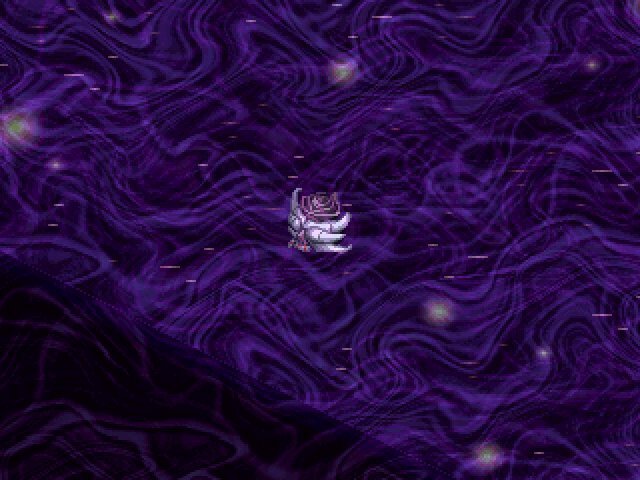 He gets killed offscreen in Alpha Gaiden's background story, then as soon as Alpha 2 rolls around, he gets killed offscreen in the first stage of Sanger's story route. It isn't until OG2 that he gets any kind of active villain role or even a face portrait, manga notwithstanding. At any rate, I really enjoyed this LP. Working on this game was a labor of love from start to finish for me, and it was really gratifying to see it showcased so well. 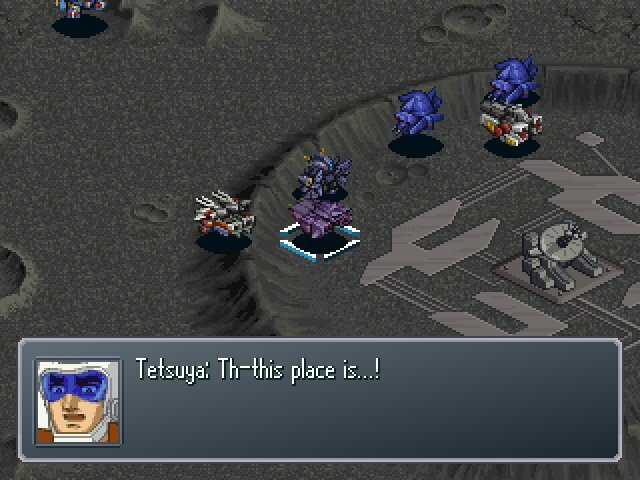 I hope that AGTP revisits the patch someday and works out some of its lingering issues, but the game is quite enjoyable either way.